Tired of keeping track of your child's sippy cups? You write their name on it, send them to daycare, and never see it again? My household has spent way too much money on sippy cups in the past until I found a solution. 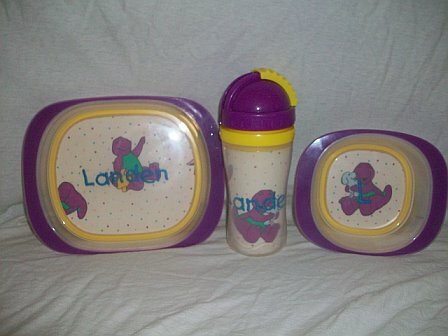 Monogrammed sippy cups!! These make a great gift!!! I promise your child will love it. I also take special requests!!! If you want to give me your own special fabric, you can do that too. Providing the fabric will only cost you $3.50 for the insert. Why not be able to have a different design for every cup you have and change it for any occasion? Perfect for each holiday and matching your child�s outfit for that day! If you are getting more than one, feel free to change it up (i.e. name on one, initials on the other.) Don't forget to let me know what me know what fabric and thread color you want. I normally try to match the thread color to the color of the cup, but the choice is yours. Under the comments section below please let me know what font, thread color, and fabric you want. Also what you want the monogram to be. It can be ONE letter, A monogram (please put first middle last and I will change it up), or a first name. "These cups are so much "FUN" for your child. My niece is 3 years old. She likes to point to each letter in her name, say the letter, then she says her name". "Everywhere I go, someone will stop me and ask me where I got my daughter's sippy cup. People think it is such a cute and neat idea". I also sell the sippy cups alone without the inserts. The sippy cups are no longer for sale in stores and Playtex is phasing them out and is no longer selling them. I have a large stock right now but once they are sold out I won't be able to get anymore. Get them while you can. Straw sippy's will continue to be sold in stores. I have both the sippy cups and the straw cups in stock. My inserts will fit both the cup and the straw sippy's so you can change them out if you want to. The cups have stabilizer on the back so that they stand firm and not droop. The Playtex Create My Own Cup is top rack dishwasher safe. Please remove the insert before washing. Below is the info on the cups from Playtex. The Create My Own CupTM is a spill-proof and insulated straw cup that you and your child can design. 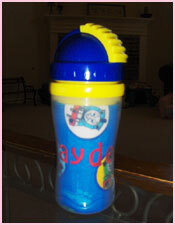 Have your child create a uniquely personal cup by coloring, drawing or using photos or stickers. Designed to let your child create a uniquely personal cup by coloring, drawing or using photos or stickers. Add photos to help your child feel close to you at daycare or away from home activities. Great for craft time and birthday party activities. Snap lock for easy assembly and disassembly. Easy to clean - All parts are top-rack dishwasher safe. Insulated to keep drinks cool and fresh longer. The Create My Own Cup is a spill-proof insulated cup that you and your child can design. 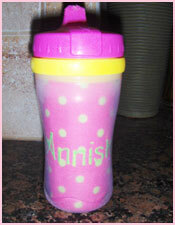 Have your child create a uniquely personal cup by coloring, drawing or using photos or stickers. Features Insulated to keep drinks cool and fresh longer Patented Playtex SipEase Valve eliminates messy spills Easy to activate - liquid flows easily when child sips Easy to clean Screw-on lid won't pop off Cup lid has convenient valve storage and is interchangeable with all Playtex. Sippy cups come with 5 coloring templates for your child to color and place in their cup.